Thank you for volunteering! Volunteers are the backbone of our organization. Currently, it takes about 2,000 dedicated and supportive community members to make the Children’s Festival a success. All volunteers are admitted free of charge. Please sign-in at the Volunteer Check-in near the Main Gate/Britt Ticket Booth. Hospitality will provide light snacks and drinks. They will not provide a meal. Please remember to bring your own food and drink! Or, you may purchase food at the Dragon Deli booth. Comfortable shoes, hat, sun glasses and sunscreen may also keep you smiling. Please Note! In an effort to reduce our waste, we encourage everyone to bring their own water bottle. Thank you! SET-UP DAY: Saturday, July 13, 8 a.m – 2 p.m. OPENING SESSION: Saturday, July 13, 4:30 – 8:30 p.m. SESSION #2: Sunday, July 14, 4:30 – 8:30 p.m.
SPECIAL SESSION EARLY ADMISSION: Monday, July 15, 9:00 a.m. SESSION #3: Monday, July 15, 9:30 a.m. – 1:00 p.m.
CLEAN-UP: Monday, July 15, 3:00 p.m. – 5 p.m.
We are excited to announce that we will be doing ALL volunteer sign-ups on-line/electronically, including the signing of the Minor Medical Release Waiver. EVERYONE…major chairs, booths chairs, and booth volunteers need to register. This process will allow us to be more efficient in the organizing of our volunteers' information, including the emergency medical information needed for all minors. Online registration will CLOSE the Friday before festival so it is important to ensure that all of your volunteers sign-up prior to arriving at Festival. MAJOR CHAIRS…it is your responsibility to ensure that all of your booth chairs are using the online registration link for all of their volunteers to sign-up. The Britt Garden is located in Jacksonville, Oregon, about five miles west of Medford and 20 miles north of Ashland. Please be very careful to follow all parking regulations. The City of Jacksonville will give you a parking ticket regardless of how much we all love the festival. Parking is available in lots on C & D Streets at the bottom of the hill (off of Oregon St). Trolleys will be running! If you park on a residential street, please be respectful of our neighbors’ privacy and property. 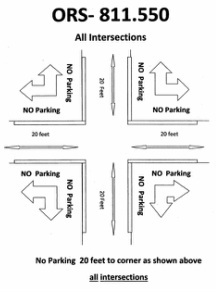 Again...please obey posted signs regarding parking on the streets or you may be ticketed. 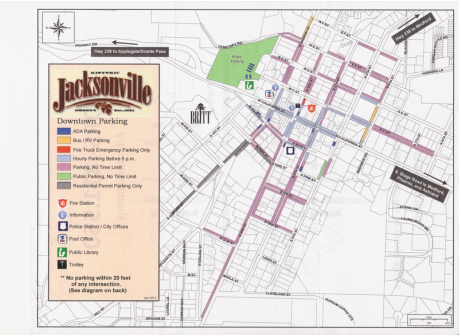 Click Map to View the City of Jacksonville's new map. No Parking within 20 feet of corners.